Gone are the days when most people opted only conventional careers like engineering, medicine, law etc. Now unconventional careers not only appeal to youngsters in India but they are also ready to take up thrilling jobs and make a living out of it. Positives maybe less competition, a greater chance of getting recognized and being able to make a difference as one is engaged in a job that one is really interested in. Here we are dealing with an unconventional, at the same time adventurous career i.e. Diving (Scuba Diving). If you love marine life and get excited at the idea of spending hours deep inside the ocean, it will be worthwhile to opt this field as a profession. In our country, diving is not promoted as a water sport, but in the west it is considered a water sport and is given much promotion. Here only few come forward to take it up as a career. Even though job prospects for this career is not bright in India, it has much scope abroad and pay package for divers are also attractive. In India, situation is bound to change, as today we don't have sufficient trained divers compared to the demand and we mainly depend on naval forces or specialists from other countries for under water operations. As a career, it is worth mentioning, that diving does not demand any basic educational qualification, anyone with guts and loves under water jobs can join for a course in diving. However to make a career as a diver, you need to attain various levels of certifications in this field. Of the various certifications, one for Scuba Diving is the most respected one. Certifications are mainly offered by associations like PADI (Professional Association of Diving Instructors), based in SantaClara, California, USA; BSAC (British Sub-Aqua Club), NAUI (National Association of Underwater Instructors), SSI (Scuba Schools International), and CMAS (French Diving Federation). PADI is the worlds most recognized certificate in Scuba Diving. PADI was founded in 1966 by John Cronin, a scuba equipment salesman for U.S. Divers, and Ralph Erickson, an educator and swimming instructor, who were concerned about the scuba diving industry. 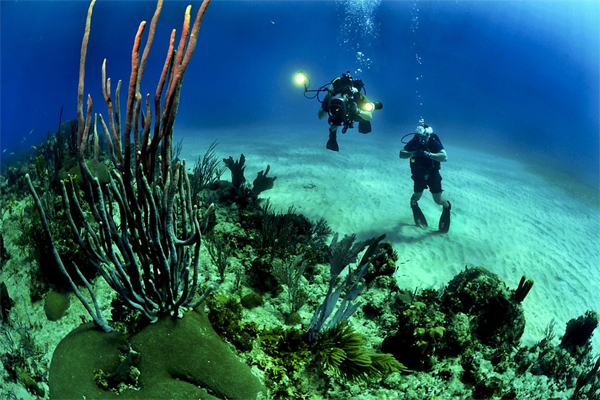 Scuba diving is underwater diving in which a diver uses a scuba set to breathe underwater. Scuba diving involves putting a heavy tank full of compressed air on your back and diving into deep water with a tiny rubber tube being the only thing that keeps you alive. The name ' Scuba' itself is derived from the apparatus used. Scuba is the acronym for 'Self Contained Underwater Breathing Apparatus'. Certifications are a must to qualify as divers and instructors. PADI courses range from entry levels (such as 'Scuba Diver' and 'Open Water Diver') to 'Master Scuba Diver' and a range of interim instructor certifications. PADI offers many programs for professional certification such as Assistant Instructor, Open Water Scuba Instructor (OWSI), Master Scuba Diver Trainer (MSDT), Divemaster, PADI Course director and so on. Training for these programs can be acquired at any PADI approved diving school. In India, you can find many diving schools in Goa, Pondicherry, Lakshadweep Islands and Andaman and Nicobar Islands. Maharashtra Tourism organises short-term programmes in scuba diving, including PADI certification courses. The Bangalore Mountaineering Club, too, offers the PADI divers course. The Barracuda Diving Institute, Goa; National Institute of Water Sports, Goa offers some scuba diving training programmes. The Thane Scuba Diving Club in association with ACUC International conducts American Canadian Underwater Certifications Instructor Trainer courses. Suganthi Devadason Marine Research Institute (SDMRI), Tuticorin, affiliated to the Manonmaniam Sundaranar University in Tamil Nadu, offers 15 days certificate course in scuba diving for marine biologists and researchers to study the impact of global warming on marine life. This institute is also offering PADI certification courses open water (level one) and advanced open water (second level) courses in scuba diving. The Navy also has their own training centre, which is approved by the International Marine Contractors Association. They give training to civilians too. Indian Navy Diving School, Kochi offers commercial diving course, those having plus two can go for it. The theory part of the training involves understanding the basic physics of what happens to human beings/diving equipment when under water. They explain how human body is affected with an increase in the pressure. Advanced levels again deal with theories of physics and how to provide first aid and rescue along with more detailed theoretical understanding of how equipments function. This career require a high degree of psychological and physical fitness. Apart from this, one who wish to enter the field must be courageous, it is not meant for the faint-hearted. Instructors require patience, good communication skills and the ability to manage people. The worldwide scuba diving industry is developing fast and good instructors are in demand. Earlier this career was popular in other countries only, but now the scope is gradually increasing in India too. Scuba diving, be it a pastime or profession, can be an awe inspiring experience of the beauty and adventure that lie beneath the ocean. The different types of scuba diving jobs are determined based on a lot of factors. This includes the level of certification achieved, the preferred work environment and whether Divers want a seasonal or full time career. They can find jobs with world organizations working in the field of sea explorations as well as Media channels like Discovery, National Geographic and Animal Planet. Besides this divers also get good opportunities in shipping companies as professional scuba divers. One may also specialize in a particular area, such as deep sea diving or underwater photography etc. One of the most popular scuba diving jobs is to be a diving instructor. As an instructor, you train and help others with the use of the equipment and also give them necessary coaching regarding underwater safety. As a certified professional Diver, you can lead recreational diving excursions, own a scuba equipment store and help in rescue efforts. Divers can assist researchers in oceanography and marine biology with their work in collecting the required underwater data. Scuba divers are extensively used for Underwater Construction such as Bridges, Platforms, Dams, Rigs etc. Divers can work for law enforcement agencies or insurance investigation firms, looking for accident victims, wreckage, or lost valuables. Some divers work at resorts as recreation specialists, acting as instructors or undersea tour guides for vacationers. Recreational diving- Recreational diving also called sports diving or sub-aquatics is a type of diving that uses Scuba equipment for the purpose of leisure and enjoyment. Technical diving- Technical divers require advanced training and extensive experience. Technical diving encompasses areas such as extreme deep diving, advanced wreck diving, and advanced cave diving. Commercial diving- Commercial divers dive for a living. Commercial divers are employed to perform tasks related to industries involving underwater work, including civil engineering tasks such as in oil exploration, offshore construction dam maintenance and harbour works. Commercial divers may also be employed to perform tasks specifically related to marine activities, such as naval diving, including the repair and inspection of boats and ships, salvage of wrecks or aquaculture. They can be recreational or technical divers. Military diving- Military diving covers all types of diving carried out by military personnel. Military diving is similar to commercial diving but also involves such tasks as underwater surveillance, mine clearing, and military research. Naval diving- Naval diving is drastically different from military diving. Naval divers work to support maintenance and repair operations on ships and military installations. Police diving- In civilian operations, many police forces operate police diving teams to perform search and recovery or search and rescue operations and to assist with the detection of crime which may involve bodies of water. Public safety diving- Public safety divers are diver rescue teams who are employed as part of a fire department, paramedical service or lifeguard unit. Lastly, there are professional divers involved in activities such as underwater photography or underwater film makers, who set out to document the underwater world, or scientific diving, including marine biology, geology, hydrology, oceanography and underwater archaeology. Experience, job location, and certifications play an important part in determining your compensation. An instructor can be paid anything from Rs. 25,000 to Rs. 50,000 per month, plus free food and good accommodation. After gaining experience, one can also start their own school. Freelance jobs are mostly seasonal, usually done for four to eight months a year. In India, the diving season lasts seven months, from October to April. However, in countries like Thailand or the Philippines, one can remain employed for 12 months.